A 2-year-old boy and four year-old girl were allegedly brutalized by their stepmother in NDC, Igabi local government area of Kaduna State. The children, Abdulrahman Abubakar and Maryam Abubakar are currently receiving treatment at a private hospital in Kaduna. According to Daily Trust, the stepmother identified as Hasiya broke Abdulrahmans left hand, right leg and Maryams head at their fathers house. The men of the Nigerian Security and Civil Defence Corps (NSCDC) are searching for the woman who fled the house after security agencies came looking for her at their residence on Monday evening, August 22. 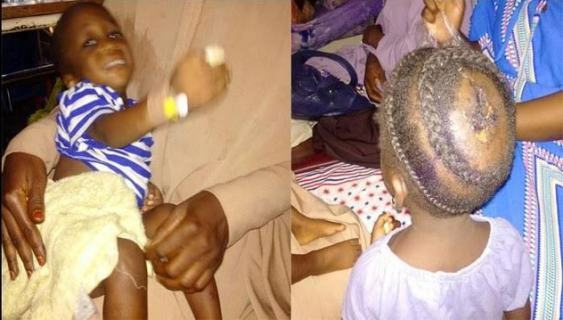 Mother of the children, Halima, who spoke to Daily Trust at the hospital on Tuesday, said she and her husband started having problem 12 days after her son was born which brought to an end, their three year old marriage. "Initially, the children were living with me after we separated, but immediately I weaned my son, the father came and took the children away first to his parents house and then to his wife. On Monday, I was on my way to the market when I got a call from the father of my children that my son was on admission at the hospital. "I quickly rushed there and when I saw the condition my son was in, I was devastated. He could hardly breathe and he had bruises on his eye, his head, his stomach and his private part. The doctor told me that the fracture on my sons hand and leg were two weeks old, and I learnt he was not able to walk and was taken to a traditional bonesetter who obviously had not been able to fix the fracture. "My son is being treated for a broken hand, a broken leg and bruises on his eye, stomach, back and private part while my daughter is being treated for a broken head after their step mother used the sole of a pointed shoe to hit her head. They were also starved in the house because if you see the way they gulped down the tea my sister made for them. The people in the hospital can bear me witness." SCDC took the children's father for interrogation and gave him 48 hours to bring the wife or face the wrath of the law.